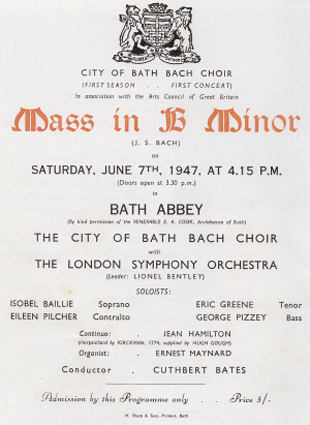 Bath Bach Choir was founded in 1946 by Cuthbert Bates, who was also a founding father of the Bath Bach Festival of 1950. The choir quickly established a reputation for adventurous programming. It gave one of the first modern performances of the Monteverdi Vespers of 1610, and put together many interesting and challenging concert programmes. Lesser known works by Handel, masterpieces by Lalande, Charpentier, Cavalli, Bononcini and Duruflé, as well as little-known Bach and Buxtehude cantatas, featured over the years. On a smaller scale, Cuthbert Bates blended old and new in the choir’s annual Carols by Candlelight concerts, which still play to packed houses every year in the Pump Room. Dr Ralph Vaughan Williams had become interested in the work of Cuthbert Bates in 1923 when he attended a Wigmore Hall concert given by Cuthbert’s London choir, the Tudor Singers. The two became friends and Vaughan Williams was the natural choice to become the first president of the choir. He was an active and useful supporter, and he conducted the choir singing The Hundredth Psalm at a concert in his honour in Bath Abbey in 1957. Sir Arthur Bliss succeeded Vaughan Williams as President and, after his death in March 1975, the distinguished choral musician Sir David Willcocks KCB CBE, then famous for his work as Director of Music at King’s College Cambridge, was invited to replace him. Sir David was the choir's president until he died in September 2015. Cuthbert Bates died suddenly in April 1980 and in recognition of his great service to the choir Sir David Willcocks conducted the July 1980 performance of Bach’s B Minor Mass as a tribute. The choir appointed as its new Musical Director the distinguished Handelian scholar Denys Darlow, who was then a senior professor at the Royal College of Music and Director of Music at St George’s Church, Hanover Square, London. Under Denys’s baton the choir spent the next 10 years building upon its reputation for fearless exploration of both major works in the choral canon and newer pieces, including its own commissions. In April 1986 the choir gave the first performance of Denys Darlow’s own Requiem, which he dedicated to the choir. On January 8, 1990, Nigel Perrin took over the baton as the new Director of Music. Under Nigel’s direction the choir has continued to move forward in its professional standing and is now one of the leading musical forces in the west country. Remaining true to its roots, the choir continues to perform both major and lesser known pieces of the classical repertoire, while introducing contemporary works and new commissions to the public. We give two major orchestral concerts every year, a concert of lighter music, a performance at the Bath International Festival's Party in the City, and the traditional Carols by Candlelight concerts in December in the Pump Room. 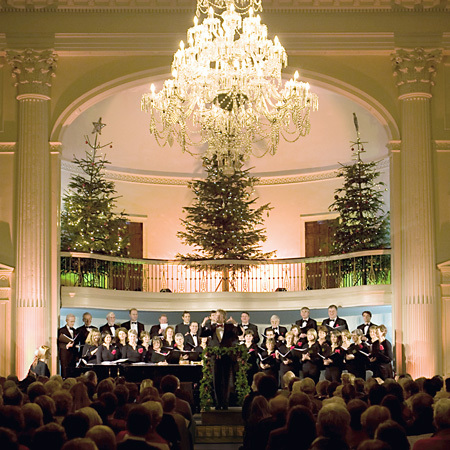 In addition we are often invited by local churches and organisations, such as the Rotary Club of Bath and the Holburne Museum, to provide a smaller choir for their special events. The choir has made many tours of the UK and has also toured abroad to France, Belgium, Hungary, Germany, Italy and Spain, in particular forging warm, cultural links with Bath's twin cities in Europe. In January 2016, the distinguished director of the London Bach Choir, David Hill MBE, became Bath Bach Choir's new president, and the composer and choral director Jonathan Willcocks accepted the role of vice-president. A fuller chronology can be found here (Wikipedia).